On the day after Christmas, the National Candy Cane Day is celebrated. A candy cane is a cane-shaped boiled sweet stick typically associated with Christmas holidays. Traditional candy canes are white with red stripes. They are typically flavored with peppermint though cinnamon-flavored candies are also quite popular. A classical recipe for peppermint candy sticks was published in the mid-1800s. These candies were straight and all white. 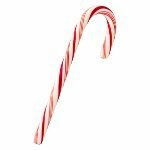 The first cane-shaped hard candy sticks were mentioned in 1866, and the red and white striped candy canes were first made around 1900. People started hanging them on Christmas trees in the early 1880s. Mass production of candy canes started in the 1920s. Candy canes are a typical Christmas treat. They are sometimes served as an additive to hot chocolate or other drinks or as an ice cream topping. They are also used to decorate Christmas trees. About two billion candy canes are made and sold each year for Christmas. By the way, the longest candy cane ever made was fifty-one feet long. It was made by Geneva pastry chef Alain Roby in 2012.